Carmen L. Errotaberea (nee Silva) of Monroe Township, N.J., died Aug. 16 at the Cranbury Center, a Genesis Healthcare facility in Monroe. She was 91. 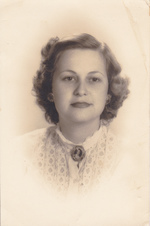 Born in Havana, Cuba, she and her husband Rogelio immigrated to the United States in February 1961 with their two oldest children. She worked for the Philadelphia Archdiocese as a social worker for 17 years before retiring. Errotaberea is survived by her beloved husband Rogelio of 65 years and her children, son Roger, and daughters Carmen (Jorge) Guiral and Beatriz (Kevin) Peters. She is survived by five grandchildren, five great-grandchildren, two sisters and many nieces and nephews. Calling hours will be held 9am to 10am on Tuesday, August 20 at the Barlow & Zimmer Funeral Home, 202 Stockton Street, Hightstown, NJ 08520. Her funeral Mass was celebrated Aug. 20 at St. Anthony of Padua Church, Hightstown, N.J. Interment was at Holy Cross Burial Park, South Brunswick, N.J.